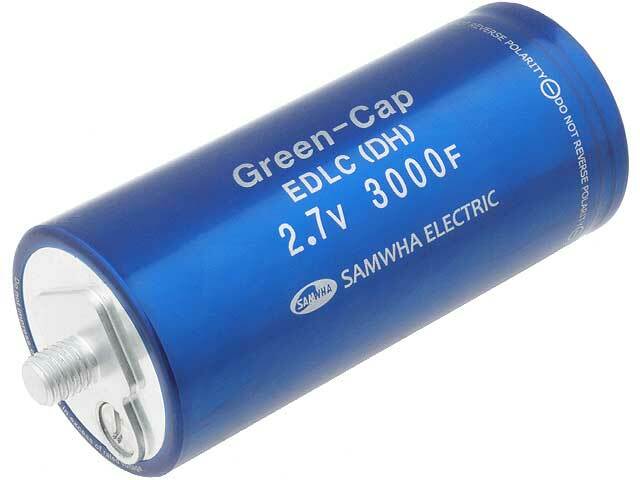 DH5U308W60138TH supercapacitors constitute a new line of SAMWHA supercapacitors offering high capacities of up to 3000F. They are available in cylindrical enclosures with screw terminals. Capacitors are characterized with considerable quantity of charging cycles of 500 000 and life of 10 years. Terminals facilitate connection of capacitors into modules, which help achieve batteries with high range of voltages and capacities. They are used in wind power stations, UPS’s, golf trucks, electric scooters and combustion engines start up systems.